brider's place: The view only changes when you're in front. Yeah, that's the tagline on T-shirt about being the lead dog. But that's not the real point of my post today. I want to talk about pacelines. Good practices, things that will make it easier and safer, and how to keep one moving well (or not, in some cases, but I'll get into that later). The impetus of this post was a training session I had with the youth tri team I help coach. Many of these kids have little group riding experience, some have none at all. Add in varying abilities, and... well, you get the idea. First, just to get the most important point and the underlying idea out there: A paceline is all about being smooth, everyone working together at the same level and speed. When you see it in action, it's a thing of beauty, looking effortless. So on to the tips. * When the rider in front pulls off, the next rider maintains THE SAME SPEED. There's always a tendency for that new lead rider to accelerate. Yes, you're no longer drafting, so the EFFORT will increase. But the speed should not increase. If it does, you'll just open up a gap behind you, make it harder for that rider who just pulled off to get back on the end of the line, and disrupt the rhythm of the group. If you want to increase the pace, do so SLOWLY. But I recommend against this -- if you feel so much stronger, then take a LONGER pull instead of a FASTER pull. But don't fry yourself to the point that you don't have the strength to make it back up to speed to catch on after your pull. * When in the line, avoid rapid speed changes. Remember that any speed changes you make will be amplified to the rider behind you, and even more so to the rider behind them. The Slinky effect. Don't coast unless you have to -- instead, soft-pedal a couple revolutions. The gap to the rider in front of you can ebb and flow slightly, and that's okay. You'll still get plenty of draft. Make reactions to that change in gap smoothly. Don't hit the brakes unless a collision is imminent, and even then it's likely you can avoid it by coasting and overlapping briefly (to the side that the lead riders are NOT pulling off toward). DO NOT bother with dropping your hand in the "slowing or stopping" signal. This only introduces instability into your position and handling as well as slowing you more quickly, causing further disruption in the line. * When you're in the front and about to pull off, signal to the following rider and pull off, THEN slow down. Too often the lead rider will look over their shoulder for traffic, signal, and coast all at the same time, and then pull off, causing all the following riders to deal with the speed change. Don't slow down until you're off the lead. * Okay, now that you're off the lead and on the way to the back of the line, don't slow down so much that you have to sprint to get back on. Remember, you're not actually resting until you're back in the line. If this is on a hill, I recommend actually keeping almost the same speed as the line, to minimize the need to accelerate to catch on. * When falling back, don't wait until the last rider has passed you to accelerate up to speed again. It helps when the last rider gives a warning (a "last" or "last rider" warning given by that last rider). Again, think smooth -- a few pedal strokes is all it should take to get back to speed, and you should be at that speed by the time that last rider is just past you, and you slip in smoothly behind them, already matching speed. * The time to eat or drink is when you're in the back of the line. * When warning for cars approaching from the rear, unless your paceline is 15 riders long (in which case it should probably be broken up into two lines) you only need ONE person to yell "car back". Every one will hear it, trust me. You don't need 7 echoes of the warning. * In a race, often the pulls are very short, and it'll be more like two lines, one moving slightly faster than the other. In cases like this, it's helpful if the the last person to pull off calls "clear" to the lead rider once they're far enough back to allow that lead rider to pull off in front of them. The trick here is to keep the speed in the "resting" line fairly close to the "working" line -- lead riders will often slow too much, causing a cascade reaction of slowing (and slowing, and SLOWING) all the way to the back so that those riders are slamming on their brakes at the same time they're trying to accelerate to catch onto the back of the "working" line. Those are most of the major points of good paceline riding. But, as I said before, there are cases when you might want to disrupt a line, make life difficult for every one. Like when you're in a break-away but your teams lead rider missed out, and you want to make sure he (or she) can catch on, or the break gets caught. In those cases, you'd do the opposite of some of the above tips. * When you get on the front, slow down a bit. Take a longer pull while you dial the speed down slightly. It will then take the rider behind you to pull through (and if they're savvy, they will) to get the groups speed back up. Don't be too obvious about this, though. * Let a gap form in front of you in the line, then sprint to close it. Riders behind you will each have to accelerate successively harder (remember that Slinky effect) to keep the line closed up, and remember that the farther back that acceleration travels, the more tired those riders are from their pull. * When pulling off the front, coast for a couple seconds before you move over. * When in the back and a rider is coming to the rear of the line, drop back and open a gap, and tell them to jump into the line in front of you. This causes momentary confusion as you communicate this, and usually causes that rider to have to accelerate harder to get in the line than they would have normally. More fatigue for them, more disruption for you. Most of the time, these tactics will only work for a while before frustration will result in one of two things: the group will dissolve into non-cooperation, or you'll be be labeled a jerk and relegated tot he back (not necessarily a bad place -- you'll be drafting off everybody). 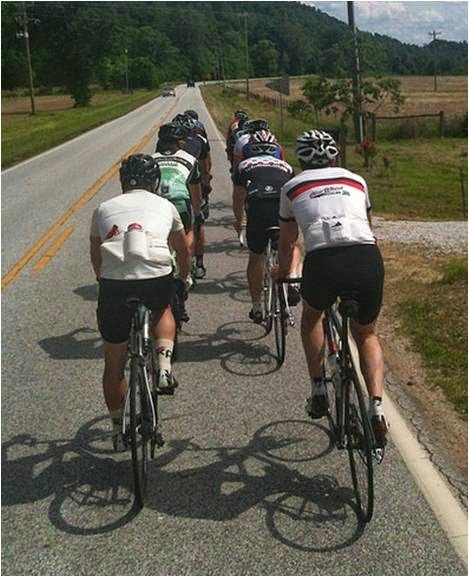 So remember, the goal of a paceline is for every one to work together to increase the group's speed. Smoothness is key and should be the mindset of every rider in the line.